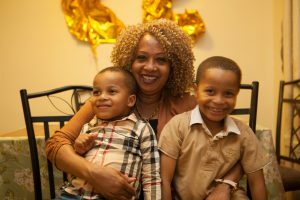 “Counseling at The Family Center saved me and my grandsons,” says Sharon, who is now raising Jahnique, 6, and Prince, 3, on her own. Her daughter and the boys’ mother, Samantha, was diagnosed with an aggressive form of breast cancer in her mid-twenties. Samantha’s boyfriend beat her and convinced her to stop chemotherapy. Learning of this abuse, Sharon invited Samantha and both boys to move into her one bedroom apartment. Around this time, Sharon was also diagnosed with breast cancer. For several months, mother and daughter traveled to treatment together, to the same hospital, often at the same time. Because Samantha had interrupted her chemotherapy, her cancer progressed to Stage IV. In July 2016, at age 27, she died. Heartbroken, Sharon and her young grandsons have moved in with her son and his family, as Sharon struggles to sort out finances and childcare. Three adults and five children, under age six, live in one apartment. Sharon, 51, sleeps on the couch. The boys still hardly understand what their mother’s death means. When their mother was confined to her hospital bed, they called each night at bedtime; five months later, most nights, they still ask to call her. Both boys are angry and have regular nightmares. Sharon, Jahnique and Prince all receive individual counseling, as well as family counseling together, at The Family Center. They are just one of the many families we serve every day. 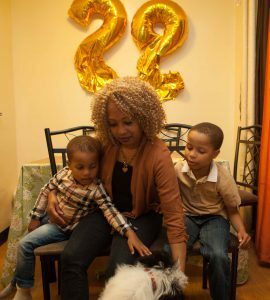 Consider supporting The Family Center’s work with families like Sharon’s.